General School Agreement – Mandatory form describing the legal and financial relationship with your school. General Participant Agreement – Mandatory form that each student participant must fill out before the program begins. Dorm Assignment worksheet (Autumn 2017) Mandatory dormitory assignment worksheet we must receive before the program begins. Student paperwork checklist – A useful table for tracking which students have completed their release paperwork. Packing list – recommended items for students and chaperones to bring when visiting the Sky School. Chaperone expectations – our expectations for chaperones on a Sky School program. Visit us again – a handout to share with students that highlights easy ways to visit Mt. Lemmon. Flagship evaluation instrument – pre-program evaluation instrument to distribute to your students. Can anyone sign up for a Sky School trip? At this time, Sky School programs are offered to school groups, not individuals. If you have a child that is interested in attending a Sky School trip, please refer his/her teacher to our website for more information. If you are a teacher in a public, charter, or private school, we’d be happy to help you schedule the perfect trip that suits your needs. If you are with another organization that serves children and are interested in having them engage in the science inquiry we provide in our programs, please contact us at uaskyschool@gmail.com to discuss the possibilities. What permission forms are needed for a Sky School trip? 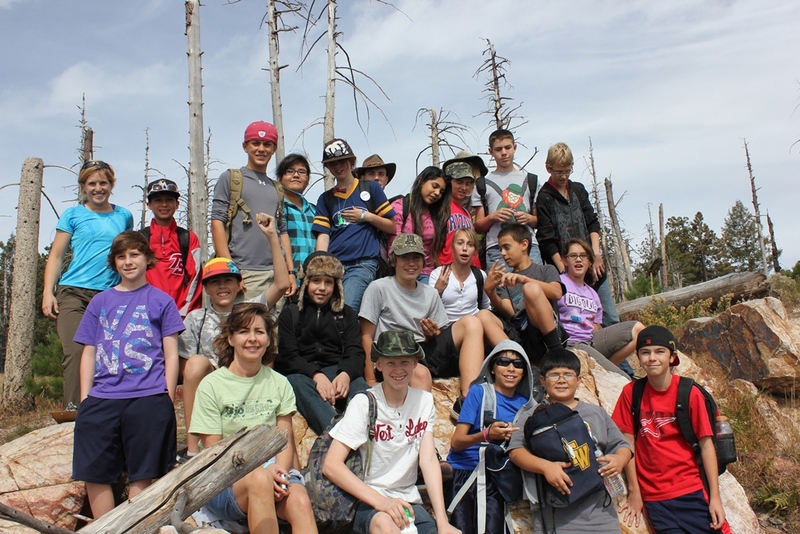 In addition to the district forms your school requires, each participant (students and chaperones) must complete the Sky School “Participant Release Form” found on our website at https://skyschool.arizona.edu/?page_id=8. Included in this is a photo release form. Please let us know in advance of your trip which, if any, students or adults do not want their picture used by UA Sky School (to share on our Facebook or web page, advertisements, etc.) since the use of social media is a part of our program through students posting blogs on our website (see https://skyschool.arizona.edu/?page_id=277) or pictures on our Facebook page (https://www.facebook.com/uaskyschool). The lead school staff member is responsible for making sure all required forms (found on our website) are complete prior to the trip. Does Sky School provide transportation? Transportation to and from Sky Center must be provided by the school. This includes the time the group spends at different stops as we travel up the mountain (typically 9 am-2 pm the first day of the trip). Groups may use a school bus, vans, or parent chaperones as drivers, depending on what your school or district provides or mandates. If transportation to a study site for the student inquiry projects on the 4 day/3 night trips is needed, it will be provided by the Sky School in a UA shuttle van. Do we need to have teacher and/or parent chaperones, or do Sky School staff members stay in the dorms with the students? Sky School staff members do not stay in the dorms with the students. It is mandatory that a lead teacher or other school staff member (ex. nurse, counselor, social worker, etc.) accompanies the student group. Other chaperones may be parents or other volunteers from the school. We require a ratio of 1 adult (teacher or chaperone) per 8 students. We require at least two male and two female chaperones unless otherwise discussed with our program director. What are the expectations for chaperones and teachers? coordinating transportation to and from our mountaintop campus. What are the sleeping arrangements at the Sky School? There are two dorms used for visitors of UA Sky School—the upper dorm and lower dorm—which are separated by gender. Room #1 in each dorm (capacity = 4 beds) is reserved for use by chaperones on a trip. This leaves 6 student rooms in the upper dorm, with a capacity of 21 students. There are 7 student rooms in the lower dorm, with a total capacity of 28. Student must bring sleeping bags to use on the beds. Dorms are heated and have a common bathroom and shower space. Any damage done to the dorms is the responsibility of the school or group attending. Prior to the trip, please complete the “Dormitory assignment worksheet” at https://skyschool.arizona.edu/?page_id=8. Does Sky School provide meals? All trips are catered by a chef from the University of Arizona. This includes 3 meals per day, as well as snacks in between meals. Students and chaperones are required to bring a bag lunch, plenty of water, and afternoon snacks for day 1 as we travel up the mountain. Please let us know ASAP if there are any food allergies or specific food needs (vegetarian, diabetic, etc.). Can the Sky School accommodate students or chaperones with disabilities? It is the goal of the University of Arizona Sky School to provide educational and programmatic experiences that are accessible for all learners. To that end, we work closely with participating schools and teachers to design programmatic activities in ways that fully engage all students, to the greatest extent possible. If, after consultation with Sky School educational staff, you anticipate the need for reasonable accommodations for any students or chaperones please contact us as soon as possible, in order that we have ample time to explore and implement effective accommodations. Examples of accommodations include but are not limited to: instructional materials in alternate formats, Sign Language Interpreting, and alternate foods. Note regarding Service Animals: Disabled individuals may be accompanied by their service animals while at the Sky School. A service animal means any dog that is individually trained to do work or perform tasks for the benefit of individuals with physical, sensory, psychiatric, intellectual, or other mental conditions. General obedience training or solely providing comfort and companionship does not meet this definition of service. Other species of animals besides dogs, trained or untrained, are not considered service animals.